Reflecting on what Manchester is famous for, its night life, music scene and great bands. Vinyll Exchange, The Hacienda, a simple graffiti music note and guitar all appeal to musicians both old and young. 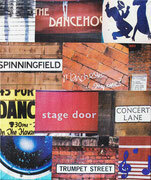 Concert venues and simple street names be it 'Concert St' or 'Trumpet St' tell a story or evoke a memory. Please note that any single image found on any of my larger canvas can be produced on 19x28cm canvas. Please just order 'custom 1928' then in the order notes field describe the image and name the canvas from which you have seen another image that you want in this format. For set discounts order 'set of 3' then name the images that you wish as your 3 images in the order notes.